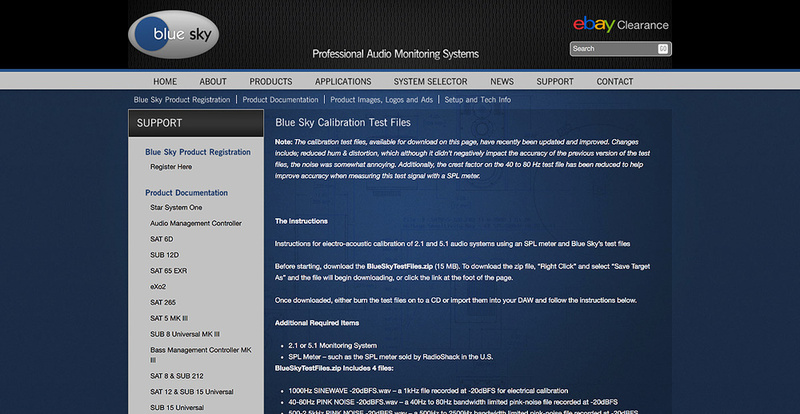 Calibration files available for download from the Blue Sky web site can help you identify and correct problems with your monitor setup. I have a set of Yamaha HS8 monitors and I set them up on my new desk the other day and noticed that the left speaker was way louder than the right. They were both on the same volume setting from the back panel so I decided to calibrate them using pink noise (at -20dBFS) with my interface master volume at its centre position, aiming at 80dB SPL in the listening position from each speaker using a dB meter app. I ended up turning the right speaker’s volume knob up about half way to get 80dB SPL, while the left only needed less than a quarter. So my question is, is it normal to have this amount of volume discrepancy between two speakers? SOS Technical Editor Hugh Robjohns replies: The short answer is that small differences in the sensitivity settings are not uncommon, but what you’re describing does sound excessive. So the first thing I’d check is that the speakers themselves, and their connecting cables, are all OK. A failing bass driver or one-legged balanced cable (where one of the two signal wires has broken) will reduce the overall volume dramatically but, bizarrely, may not be immediately obvious when listening in stereo. The easiest way to make these checks is to swap the speakers over (having set their rear-panel controls the same), and then swap their cables. If the louder side moves you’ll have found the cause! And talking of rear-panel switches, having one set for quarter space and the other for free space can make a big difference to the amount of low end they produce, so take care over choosing and implementing any configuration settings. If you’re confident that the speakers are set up and working identically, and the cables are good, then the issue will either be upstream (in the monitor controller, audio interface or DAW software — and again, channel swapping will usually identify the culprit) or in the room’s own acoustics. If the speakers aren’t set up symmetrically in the room, one speaker might end up with more boundary-effect bass boost than the other, for example, so some experimentation with placement, and trying to achieve a more symmetrical layout, would be worthwhile. It’s also possible that the measurement microphone is capturing different levels from each speaker because it’s in a node from one and an antinode from the other! In your case, though, you can hear the problem so it’s obviously more than just a measurement issue — but this kind of thing can be a real problem, especially when aligning subwoofers. For that reason, when aligning satellite speakers it’s always best to use band-limited pink noise, rather than full-range noise. The benefit is that the absence of low end in the test signal avoids most issues with LF room nodes, and the constrained high-end minimises issues connected with strong local HF reflections. The Blue Sky speaker company have some very useful audio test files available for free download here: http://abluesky.com/support/blue-sky-calibration-test-files/. Use the band-limited (500Hz-2.5kHz) pink noise file when calibrating your main speakers. And finally, when working with a normal stereo speaker array, I prefer to only measure and calibrate one speaker rather than both. The reason is that the inherent meter tolerance when reading a noise signal means the two speakers will always end up being slightly different — enough to pull the phantom centre off slightly to one side. So, I align one with the meter, and then adjust the second by ear while listening to a (dual) mono signal until the phantom centre image is actually mid-way between the two speakers.